A sign of things to come in L.A.? This photo was taken a few years ago in Boston. Photo by Scott Tingley, via Flickr creative commons. Curbed posts a short Metro staff report on the timeline to install wifi and cell service in underground stations. Under the current timeline, wifi would be coming to the Red/Purple Line subway stations between Union Station and 7th/Metro Center in May and cell service in that stretch of track by August. The rest of the Red/Purple Line and the Gold Line tunnels would be completed from late 2015 through March 2017. The football stadium — if it actually gets built — would be on the old Hollywood Park site. Looks like a new stadium would be about a 1.5-mile walk away from the nearest Metro Rail station, the Florence/La Brea Station for the Crenshaw/LAX Line. That’s walkable or within reach of a shuttle. Obviously Hollywood Park isn’t as close to Metro Rail as the proposed football stadium at L.A. Live in DTLA or the L.A. Coliseum. Then again, this proposal seems a little more serious as it’s being tourted by someone who already owns a team. What remains to be seen is whether St. Louis matches the offer and replaces the Rams’ current home, a domed stadium completed in the ancient times that were 1995. Quasi-related: three of the four NFL playoff games this coming weekend look pretty good on paper, especially the Dallas-Green Bay and Indy-Denver games. If you’re headed out to watch them at one of our many fine establishments, please consider taking transit and not driving after three hours or more of adult beverages and/or chicken wings. The electric bus prototype. Photo: Metro/BYD. Metro last month took an electric bus manufactured by BYD Motors for a test-drive to check out the technology — Metro has five electric buses from the company on order. Please see this earlier Source post for more info. A ground-breaking ceremony is set for Tuesday in downtown Fresno on the initial 29-mile segment between Fresno and Madera. As for the rest of the line between Los Angeles and San Francisco, the article offers up plenty of skepticism, saying that to meet a goal of 2028, another $26 billion, assuming state cap-and-trade fees meet the high end of their projections. As I’ve said before, I can see a bullet train being very popular but the funding issues are still daunting and unresolved. Frequent public transit riders will tell you that the biggest headache of their commute isn’t always the unreliable service (if they take San Francisco’s Muni), the filthy seats (if they take BART, which is finally finishing its replacement seat project) or even the infrequent service (if they use most any other transit system in the Bay Area). Often, the worst thing about being a transit rider is the other riders. They slam into others with their overstuffed backpacks. They eat far-too-fragrant food in the enclosed space. They refuse to give up their seats for struggling pregnant women or the elderly, or — worst of all — they spread their legs wide open, preventing anyone from taking a seat next to them at all. Here’s the good news: Some transit agencies have noticed, too. New York City just launched a campaign called “Courtesy Counts, Manners Make a Better Ride” to educate its ever-growing number of transit riders about the basic etiquette required for living in an urban environment. That’s a pretty tough statement saying that other riders are what deters people from taking transit — I tend to think convenience is a more important factor. Please let me know what you think, riders. And, please, one comment per customer. 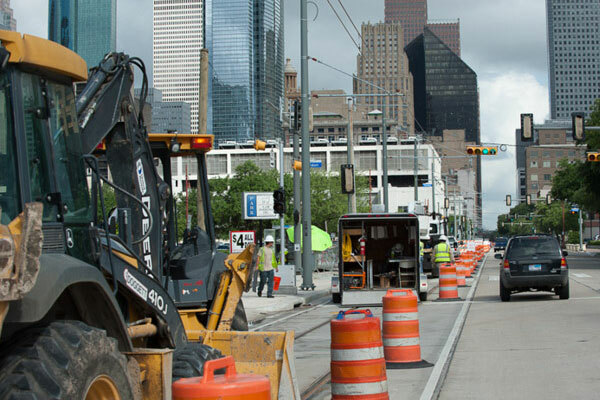 Work on a new light rail line in downtown Houston. Photo: Houston Metro. Very good blog post — definitely check out the great graphic that Yonah posted at the top of his piece. As regular readers here know, Metro has five projects under construction although none are scheduled to open in 2015. The Expo Line to downtown Santa Monica and the Gold Line to Azusa are expected to open in the first half of 2016 while serious work will continue or begin this year on the Crenshaw/LAX Line (2019), Regional Connector (2020) and the Purple Line Extension to La Cienega Boulevard in Beverly Hills (2023). As for the national scene, it’s interesting to see that six bus rapid transit lines (BRT) are scheduled to open this year with another seven beginning construction. BRT is usually far less expensive than rail projects but has never really gotten a foothold in the U.S. due to factors including speed, capacity and the willingness of residents to surrender a lane or more of general traffic lanes to transit. I visited the parental units in Ohio over the holidays. Gas was as low as $1.83 a gallon and I filled up my rental car for about $20. I don’t recall spending that little on gas since the ’90s and I agree with the New Yorker: I am very doubtful these type of prices will last. Tell me this: Why can oil companies make billions of dollars in profit even after all the costs associated with drilling, research, refinement, storage, and distribution while mass transit is unable to make any profit? Last time I calculated it out, my hybrid car was averaging 8 cents a mile in gas. The calculation is easy: (cost of gas at fill up) / (odometer reading at fillup – odometer reading at last fill up). And before the people say that you forgot insurance and maintenance, no, you can’t include insurance and maintenance here because 8 cents a mile is the model of how oil companies get rich. Adding in cost of insurance and maintenance is the cost to the car owner, not the profit making scheme of the oil companies. So oil companies are essentially selling gas, where it essentially costs about 8 cents a mile, and they make huge profit. including after all the costs associated with finding, refining, and distributing the gasoline. And that’s just with a single driver. When you carpool, then the cost gets further divided to as cheap as 2 cents per mile per person for gasoline. And oil companies still make profit. So tell me why again why mass transit can’t be profitable under a cheaply rated distance based fare scheme just like oil companies are doing? Because that’s what they are doing: selling gas that comes down to pennies per mile. And you think mass transit is able to compete with that where prices are the same $1.75 or so regardless you go 1 mile or 20 miles? Mass transit isn’t cheap on a flat rate system, especially for shorter trips. While you pay $1.75 to go to the neighborhood supermarket, the hybrid car gets you there in 8 cents a mile. If Ralphs is 2 miles away, the cost of a roundtrip in gas on a car is 32 cents. Thirty-two cents versus $3.50 (you can’t use Metro for roundtrip) for two miles, no one is gonna use Metro. And public transit isn’t profitable at a flat rate model, yet oil companies make profit at that 8 cent/mi rate. Anyone with basic math skills can figure this out. Again, you can’t use insurance and maintenance costs into this because the point is how oil companies make profit. They make profit by selling gas at 8 cents a mile. And that’s including all the costs associated with oil refinement.